It is an honor to address the Human Rights Council in this year that bears immense significance for children’s rights. I am especially pleased to once again share this interactive dialogue with my colleague Marta Santos Pais, who is a close ally in the protection of children from violence and war. As we celebrate the thirtieth anniversary of the Convention on the Rights of the Child and prepare for next year’s twentieth anniversary of the Optional Protocol on the involvement of children in armed conflict, the rights contained in those milestone documents are under threat. Protracted and high-intensity conflicts, cyclical spikes in violence, operations to counter violent extremism and cross-border operations by parties to conflict have continued to make children around the world the primary victims of war. I would like to use this opportunity to touch upon three trends that require our particular attention: the plight of children detained for their alleged association to violent extremist groups; attacks on schools and abductions of children and its cross border effects. Child recruitment and use by non-State armed groups using violent extremist tactics raises new challenges from a child protection perspective. The transnational nature of violent extremism and protracted conflicts have favored the emergence of transnational recruitment and the involvement of children in the phenomenon of foreign fighters. It is estimated that since 2011, between 30,000 and 42,000 foreign fighters from some 120 countries have travelled to Iraq and the Syrian Arab Republic to join groups affiliated to ISIL or Al-Qaida. Those numbers include a significant proportion of children. Additionally, large numbers of children are arrested and detained for their alleged association with parties to conflict during operations to counter violent extremism, as well as in other contexts of hostilities. All children under the age of 18 associated with parties to conflict, including those using violent extremist tactics, should be primarily treated as victims and with the best interest of the child as a guiding principle. Addressing this issue requires the engagement of all stakeholders in an integrated approach. Such an engagement would respect the rule of law, international human rights, humanitarian and refugee law, while recognizing legitimate security concerns. If a child is accused of a crime during his or her association with armed groups, juvenile justice standards and standards of fair trial must be applied. Further, it is key to welcome back the most vulnerable who were victims of the worst atrocities. Long-term and sustainable rehabilitation and reintegration into society should be the primary objective. I call on all parties to ensure that these children, who are in dire need of reintegration services, can take their place as peaceful members of society and break the cycles of violence. The year 2018 was also marked by a significant rise in attacks on schools and the military use of schools. An increasing number of children have no access to education because their schools are attacked, destroyed, damaged or occupied. In conflict situations around the world, schools were targeted for acts of retaliation, for child abductions or to impose religious ideology and doctrine. Children are afraid to attend classes because they may be exposed to abduction, recruitment or sexual violence by parties to conflict on the road or in the school itself. I call on all parties to conflict to enable unimpeded access to education for children. I encourage Member States to better protect schools, schoolchildren and teachers, to implement concrete measures to deter the military use of schools and to ensure the continuation of education in conflict situations. I also reiterate my call on Member States that have not yet done so, to endorse the Safe Schools Declaration. In recent years we have seen an increase in child abductions in conflict situations. Abductions are frequently a precursor to other violations against children, such as recruitment and use or sexual violence. For instance, in Nigeria, Boko Haram often specifically abducts girls to use them as human bombs, tying improvised explosive devices to their bodies and forcing them to perpetrate suicide attacks. Abductions also have immense cross-border effects, as armed groups like Boko Haram and ISIL abduct children and bring them to neighboring countries to be trained, used as fighters, married, sold or enslaved. This leads to challenges regarding cross-border repatriation and reintegration of children captured or released in countries other than their countries of origin. Efforts to address these violations have to involve regional and sub-regional approaches. I therefore call upon Member States, regional and sub-regional organizations to ensure the protection of children from abductions, ensure accountability for perpetrators and to engage closely with the United Nations to ensure a coordinated response. To this effect, my Office is working on a Guidance Note to provide practitioners with conceptual clarity, measures and tools to respond to this grave violation. 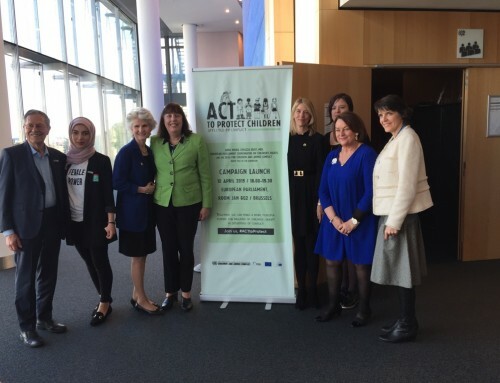 Notwithstanding continued violations against children affected by armed conflict, where we have joined forces, we have also been able to achieve important progress in strengthening the protection of children from the effects of conflict. Our engagement with Governments and non-State armed groups to end and prevent grave violations against children has continued to produce tangible results. To name but a few, in Afghanistan, amendments to the criminal code criminalizing the recruitment and use of children by armed forces entered into force in 2018. In Nigeria, the Civilian Joint Task Force released 833 children in compliance with the Action Plan signed with the United Nations. In South Sudan, a new comprehensive Action Plan covering all six grave violations is currently being developed with the Government, the first of its kind. 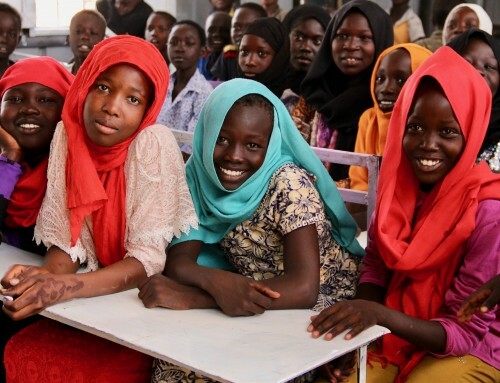 In the Sudan, the implementation of the action plan to end and prevent the recruitment and use of children by the Sudanese Armed Forces was finalized in 2018. During my visit to the Sudan in February 2018, I advocated for the adoption of a national prevention plan to enhance the protection of children. The Government welcomed the initiative and the plan is currently under development. Regarding Yemen, my recent mission to Riyadh was an opportunity to discuss the protective measures that have been taken by the Coalition to restore legitimacy in the past two years, including the establishment of a child protection unit. I am planning to support these efforts through trainings focused on enhancing preventive measures for the protection of children in Yemen, in partnership with other UN entities. In line with Security Council Resolution 2427 (2018), which requested me to engage proactively with regional and sub-regional organizations, I have reached out to the Great Lakes Region to prepare the ground for a sub-regional plan on ending and preventing violations against children and addressing their cross-border effects. Notwithstanding these positive developments, we can, and must do more to ensure that children affected by conflict receive the protection they need and deserve. As announced last year, I enhanced my activities in terms of public awareness raising and engagement with partners to mobilize global action. I engaged with parties to conflict during visits to Myanmar, Sudan, South Sudan, and Colombia, among others. I have also closely cooperated with regional organizations such as the NATO, the African Union and the European Union to support them in strengthening their child protection frameworks. I am especially pleased to announce the opening of the UN Liaison Office for Children and Armed conflict in Europe. 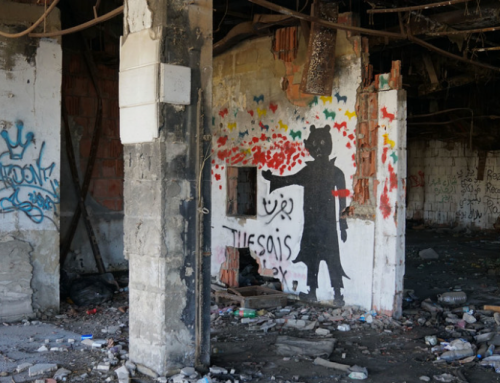 This Brussels-based Office liaises on the issue of children and armed conflict with Europe-based international and regional organizations, including Geneva-based human rights mechanisms and UN entities. Tapping on the more than 20 years of existence of the mandate, I have also started carrying out lessons learned initiatives in order to compile best practices on the children and armed conflict mandate. I have put a specific focus on the inclusion of child protection issues in peace processes. Including these issues early on in peace processes is not only important for the protection of children but can build trust between the parties. The ongoing peace processes or similar initiatives in the Central African Republic, Myanmar, South Sudan, Sudan and Yemen provide an important momentum for this and I am advocating for the protection of children as an integral part of these processes. I am further developing a guidance for mediators to include child protection issues in their efforts, as requested by the Security Council. In collaboration with UNICEF, I conducted regional coordination workshops on the monitoring and reporting mechanism in the Middle East and East Africa, bringing together country task forces on children and armed conflict to strengthen their ability to support the mandate as well as other UN entities. More regional workshops of this kind will follow in Asia and in West Africa. While I welcome that a large number of children were released by parties to armed conflict during 2018, I remain concerned at the lack of adequate reintegration support available to these children. The lack of assistance makes them vulnerable to re-recruitment and risks to perpetuate cycles of violence. 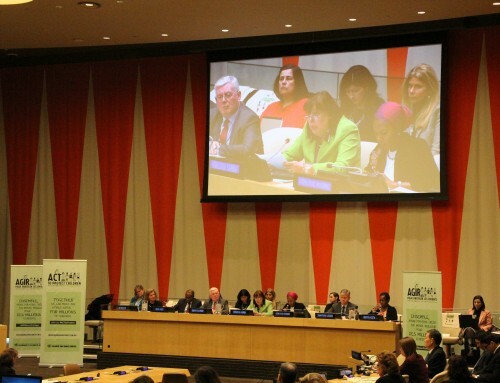 Together with UNICEF, I have therefore launched a Global Coalition for Reintegration. This Coalition is working to explore the scope, parameters and structure of a comprehensive and sustainable mechanism to support all children coming out of armed groups and forces. 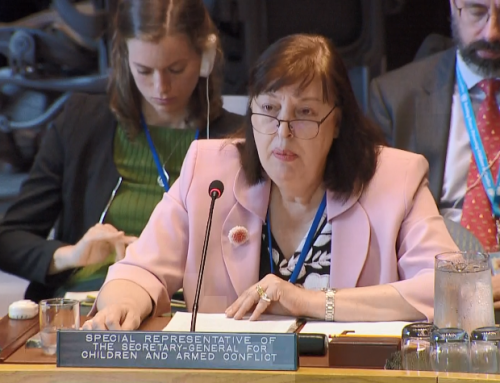 Further, allow me to recall that with South Sudan’s ratification of the Optional Protocol to the Convention on the Rights of the Child on the involvement of children in armed conflict last September, this important protocol now counts 168 state parties. I call on all Member States that have not yet done so to ratify the Optional Protocol. 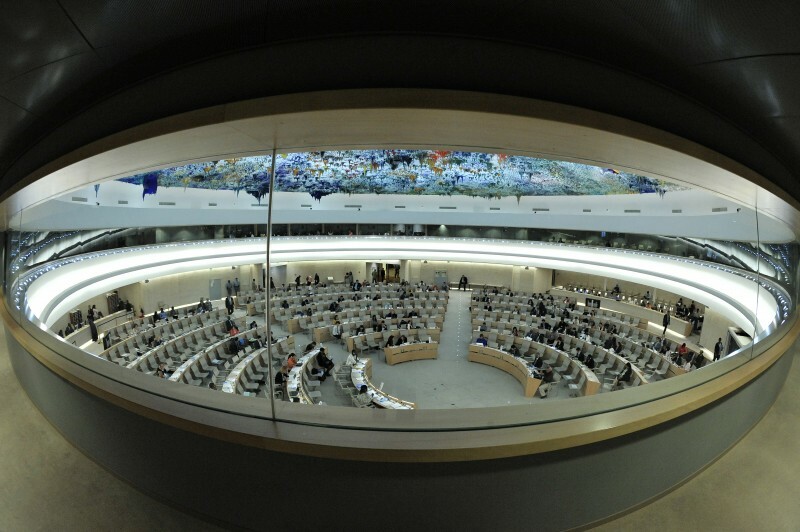 Lastly, I want to seize this occasion to reiterate the significant role the Human Rights Council plays in addressing violations against children and to strongly encourage you to maintain the practice of including recommendations on the protection of children affected by armed conflict when considering or adopting relevant resolutions. I also encourage you to continue including the issue of children and armed conflict in country-specific recommendations of the Universal Periodic Review (UPR) mechanism to reinforce common advocacy efforts. My Office stands ready to continue to support you in this regard. Let us not forget that for every child that we protect from armed conflict we make a direct contribution to breaking cycles of violence, preventing future conflicts and realizing the Sustainable Development Goals.